Ankylosaurus was a type of dinosaur (for more information see Ankylosaurus Classification). 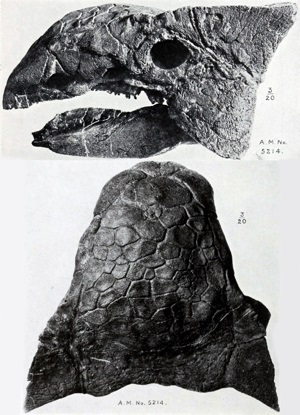 Only one species of Ankylosaurus is currently known: Ankylosaurus magniventris. However, a number of related types of armored dinosaurs are also known. Ankylosaurus was a slow-moving herbivore (ate plants) (for more information see Ankylosaurus Diet). Ankylosaurus would have needed protection from other carnivorous (meat-eating) dinosaurs. It got its protection from its armor, and the club in its tail. The armor consisted of hundreds of bony plates embedded into its leathery skin, as well as four spikes on its head. Additionally, its tail was equipped with a heavy bony growth, which it could have swung as a club to drive away predators. (for more information see Ankylosaurus Armor). Ankylosaurus lived in North America during the late Cretaceous period, between about 74 million and 65 million years ago. It was one of the dinosaurs which died out during the K-T Extinction - the mass extinction which marked the end of the period in which dinosaurs lived. Ankylosaurus was huge. An average adult was probably about 33 feet (10 meters) long, and weighed something in the region of 4 tons. The name "Ankylosaurus" was chosen by Barnum Brown in 1908. The name "Ankylosaurus", like most scientific names, is derived from ancient Greek - it means "stiffened lizard".